Several important events have occurred in Southeast Asia very recently, which shed a new light on the evolution and the current state of the conflict between China and the USA. The first aspect worth focusing on is the fact that President Donald Trump did not attend either the East Asia Summit (EAS, based on ASEAN + 6 mechanism) in Singapore or the APEC (the Asia-Pacific Economic Cooperation) Summit in Papua New Guinea. Instead of him, the US Vice President, Mike Pence, participated in these meetings, crucial for the countries of the region. And he was not simply present at these events. In the interview with the Washington Post, he preemptively appeared to have threatened Beijing with a cold war scenario unless China changed its policy. According to Mike Pence, Donald Trump was willing to normalize relations with China, but PRC, in turn, had to be prepared to radically alter its current course, first and foremost in the economic and military spheres. As he stated, Beijing needed to have accomplished this by 1 December, when the leaders of the two nations were to meet at the G20 Summit in Buenos Aires. Mike Pence also accused China of interfering in US domestic affairs, manipulating “American democratic processes”, and practically striving to replace the President of the United States. As for Asia, Mike Pence constantly pointed out that China was a dangerous foe to Asian countries, while the United States was a friendly nation, which pursued peaceful policies and impeded Beijing’s conniving plans that threatened democracy and sovereignty of the Asia Pacific states. At the EAS (based on ASEAN + 6 mechanism), Mike Pence actively promoted the concept of a free and open Indo-Pacific, which was articulated a year ago by Donald Trump at the APEC Summit in Vietnam. During the summits it became clear that besides Washington, Australia, India and Japan also support this idea. Mike Pence used the following persuasive language in Singapore: “We will continue to ensure that all nations, large and small, can thrive and prosper in a free and open Indo-Pacific. Authoritarianism and aggression have no place in the Indo-Pacific. In all that we do, the United States seeks collaboration, not control.” Mike Pence addressed the ASEAN leaders by promising “to uphold the freedom of the seas and the skies” in Southeast Asia, and to ensure security within sovereign land and maritime borders, as well as in cyberspace. This combative anti-Chinese stance, expressed by the official representative of the White House, culminated with his speech at the APEC Summit, which followed straight after the talk by the President of the People’s Republic of China, Xi Jinping. Mike Pence stated “We don’t offer” our partners “a constricting belt or a one way road,” using an ironic play on words to refer to China’s One Belt One Road initiative. “Do not accept foreign debt that could compromise your sovereignty. Protect your interests. Preserve your independence. And, just like America, always put your country first,” Mike Pence advised the APEC participants. Obviously, in his opinion, only a partnership with Washington would yield benefits. The US Vice President also constantly admonished China for its unfair trading practices and talked about the tariffs imposed on Chinese goods. “The United States though will not change course until China changes its ways. We’ve taken decisive action to address our trade imbalance with China. We’ve put tariffs on $250 billion in Chinese goods and we could more than double that number,” promised Mike Pence. To summarize the analyses of Mike Pence’s speeches during his official trips, it is safe to say that the United States has not demonstrated any willingness to compromise towards China. Instead he showed, in every way possible, who enforced the rules of the game in our modern world and in Asia. Naturally, such a US stance was literally met with open hostility by the representatives from China. This was especially noticeable during the APEC Summit. Disputes and arguments were so heated that it was impossible to agree on a joint formal statement at the end of the summit. And the document, which was issued in the end, turned out to be full of meaningless words and wishes, which did not include any mention of the tariffs and trade issues. The Prime Minister of Papua New Guinea, Peter O’Neill’s comments on the fruitless attempts to agree on the statement, made at the concluding press conference, included an explanation for the difficulties encountered. When “The two big giants in the room,” were unable to agree (referring to China and the United States), it was difficult to get anything done. Incidentally, according to some sources, it was the Chinese delegation that objected to the first version of the joint statement, as the drafted document included several points which were unacceptable to the PRC. As, for instance, the fact that it mentioned China’s violation of the World Trade Organization’s rules pertaining to fair trade practices. According to eye-witnesses, in Trump’s absence the Chinese felt a great degree of confidence. Based on unofficial sources, they even attempted to muscle their way into a local government’s conference hall, where work on the end-of-the-summit joint statement was ongoing in order to influence the document’s content. The delegates were so persistent that the police had to be summoned for help. But the truth is that there was no official confirmation of the incident taking place. The confidence, exhibited by the Chinese during the past summits, is quite justifiable. After all Asian partners and PRC’s neighbors did not hide their disappointment about Donald Trump’s absence, and the resulting lack of interest by Americans in Southeast Asian affairs. Mike Pence’s statements clearly did not inspire them and failed to instill any optimism about US policy’s goals and approaches. Hence, on the very first day of the ASEAN Summit, Singapore’s leading newspaper, The Straits Times, published some excerpts from a discussion, whose participants included representatives of the US Department of State and of the US Embassy in Singapore, as well as a veteran in Singapore’s diplomatic circles and the Ambassador-at-Large for the city-state, Tommy Koh. The President of the Philippines, Rodrigo Duterte, took an even more anti-American stance. During his speech he said that the United States and its allies needed to accept the fact that “”China is already in possession (of the South China Sea)”. Rodrigo Duterte also called on the US to stop its military drills and vessel movements aimed at provoking a response from Beijing. According to his statements, it would be better for all the disputes in this region to be resolved by ASEAN members and China without involving the USA and its allies. In addition, Rodrigo Duterte stopped using the term the West Philippine Sea (the name used for the South China Sea in Manila up until then). Another anti-American sentiment was expressed, surprisingly, by the veteran of regional politics and the Prime Minister of Malaysia, Mahathir Bin Mohamad. He told Washington to stop sending “warships” to the South China Sea and instead use small patrol boats to avoid sparking conflicts. In response, Mike Pence later stated that Washington would continue to exercise its lawful right to sail ships and fly planes in any regions in the US national interests. And the South China Sea, according to his statements, cannot belong to anyone. The fact that the US influence in Southeast Asia continues to diminish is readily apparent to Americans, despite their bellicose rhetoric. They can see that they are not in control of key processes shaping the current state of affairs in Southeast Asian. For example, they have no influence on a South China Sea Code of Conduct, being prepared by Beijing and ASEAN member-states. This crucial document will determine the code of conduct during disputes and include means of resolving them. The possibility that China will be able to convince its partners and neighbors (and it does have a lot of leverage at its disposal) to include a clause in the Code of Conduct requiring any military drills, conducted with countries located outside of the region, to be approved ahead of time by the nations with direct access to the South China Sea is especially unpleasant for Americans. And if concerns are voiced by any of these countries, the military exercises will not be allowed. In this manner, China will have a legal basis for blocking naval exercises conducted by the USA, Japan and other nations in the South China Sea. This will noticeably strengthen its position in the region and bring it closer to its long-cherished goal to oust the United States (and especially its military) from the region. Another Chinese project, which the USA is not a part of and has no influence on, has the same aim. We are referring to the creation of the largest trade bloc here, the Regional Comprehensive Economic Partnership (RCEP). New life was breathed into this initiative after the United States pulled out of the Trans-Pacific Partnership (TPP). Both Prime Ministers of China and Singapore jointly announced that an agreement on this partnership would be signed the following year. It is expected that, aside from ASEAN member-states, Australia, China, India, Japan, New Zealand and South Korea will become pat of it. It is extremely important that, today, not only China but also Indonesia (the biggest nation in terms of land area and size of economy among Southeast Asian countries) is playing an active role as the RCEP organizer. Indonesians explain their stance to support this initiative simply and logically. An editorial in the newspaper, the Jakarta Post, reported that China, the largest economy in the region, was on the rise, and it was committed to finalizing the agreement on the Regional Comprehensive Economic Partnership that year, which would strengthen the ASEAN partnership. When the new trade bloc is established, it will comprise 16 nations, including the ten ASEAN member-states as well as China, Japan, South Korea, India, Australia and New Zealand. 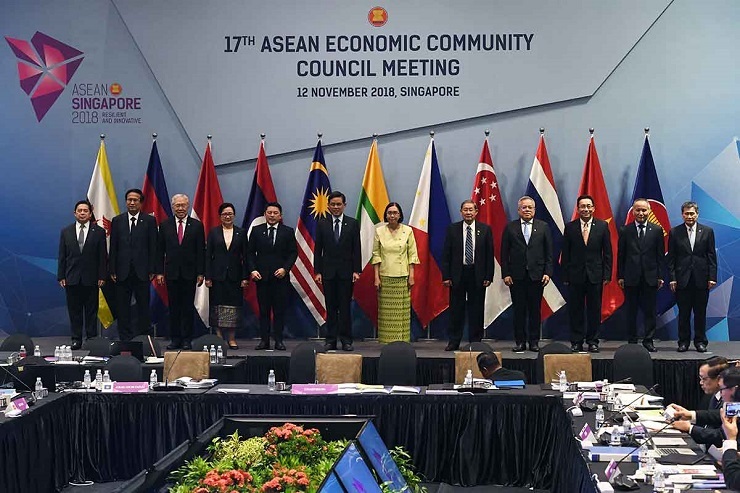 “The trade agreement will account for 50 percent of the world’s population and 30 percent of the world’s gross domestic product.” The newspaper points out that for ASEAN members and China “cooperation is the wisest choice” despite unresolved problems. For ASEAN, China is no longer a critical threat, in spite of its economic might. ASEAN member-states have the necessary leverage to act as a counter-weight to their giant neighbor. One Indonesian scientist once joked that ASEAN had mastered the skills of a tamer in order to conduct negotiations with other countries. It is without a doubt that ASEAN will part with its illusion of being China’s tamer very soon. However, the state of affairs is such that, whether we like it or not, today and for the foreseeable future China is a priority for the ASEAN member-states. And not only for them. This indeed is a pithy conclusion by Indonesia’s leading official newspaper. And it is difficult to add something worthy to it.